St. Croix continues to recover from the devastating effects of two Category 5 hurricanes that hit the island in less than two weeks during September 2017. 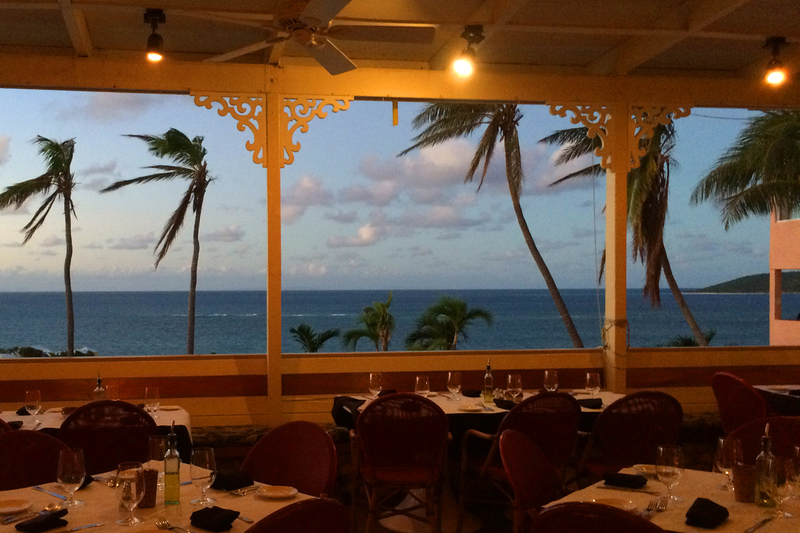 While it and many other Caribbean islands won’t be fully recovered for quite some time, St. Croix’s restaurant scene is reemerging. I spent more than three months on St. Croix, working with the disaster relief efforts. As an admitted foodie, the initial weeks were difficult. The number of open restaurants was limited, as were their menus and hours of operation. With the island’s power grid decimated, there were no streetlights or lights for parking lots, so many establishments chose to close before the sun went down. But the power grid is largely restored, especially in Christiansted. Many restaurants have made the repairs they needed, and have reopened to the delight of many who had long ago tired of subsisting on burgers, chicken wings, fries, and the occasional quesadilla. These are some of the restaurants I tried, and either enjoyed or would recommend against. The list was current when I left the island in late January; no doubt other establishments will come back over time. Probably my favorite place on the island, Galangal presents an interesting array of Southeast Asian dishes with curries representative of several different regions of Asia, as well as other dishes with a French influence. 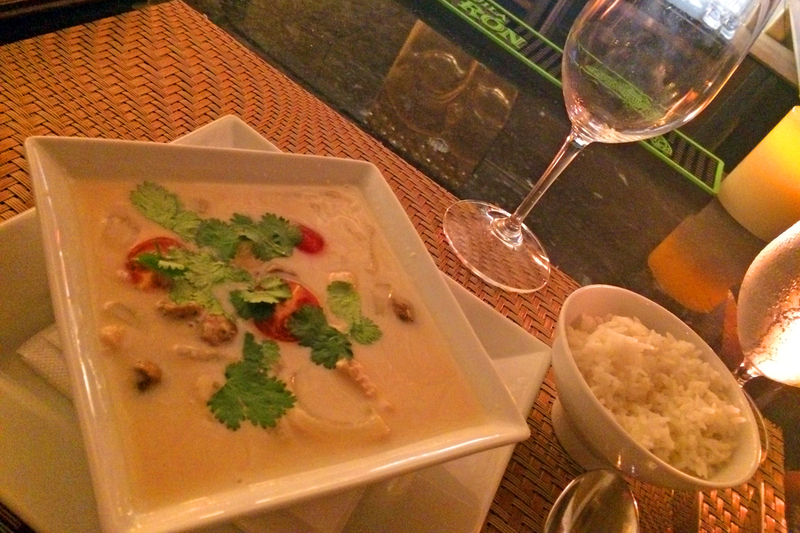 The food is fresh, tasty, and not exactly what you might find in a typical Thai restaurant. At Galangal, they make the sauces in house, which gives them a fresher and more authentic feel then most Thai restaurants. In addition, the owners make periodic trips to Southeast Asia and bring back about 200 pounds of various types of peppers each trip. The ingredients are indeed authentic. Arthur, one of the owners, is German and he and partner Gregory have brought in some German wines that complement the spicy Asian food extremely well. As their menu says, if you've never been to Germany, you need to try some of their wines. My favorite is the Juliusspital dry Riesling, which my wife and I first tasted while visiting Würzburg in 2016. It and the others are delightful, and even the Rieslings are not at all sweet, unlike American varieties. 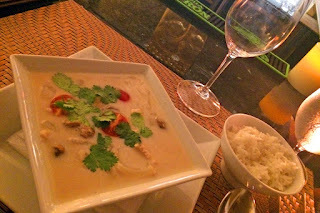 On my first visit, I had summer rolls, chicken satay with a house-made peanut sauce, and Tom Ka Gai, one of the freshest renderings of that particular soup I have ever enjoyed. 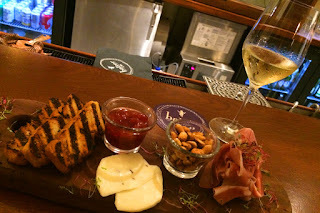 Paired with a dry German Riesling, I was sorry I didn't have room to try more of their delightful offerings. All the dishes I had were from the appetizer menu, but I left feeling quite satisfied. On a subsequent visit, I decided to try their mussels, again from the appetizer menu. Done in a spicy coconut curry sauce, they were not what you might expect from mussels, but very tasty. My server suggested a side of steamed rice to soak up any remaining broth. Paired with a dry German Riesling, they were hard to beat. Sadly, I never made it to the main courses, but they range from pad Thai to massaman, red and green Thai curries, as well as rack of lamb and NY Strip Steak for the less adventuresome. Yes, it’s weird that they us a lower case “b” and spell it “balter” but there’s nothing weird about the delicious food and excellent service. 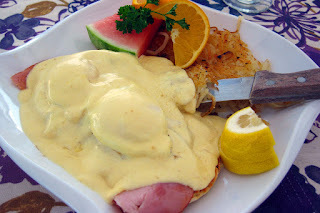 I ate there several times during my stay on the island and it was always a delight to go back. Patrick and Cindy, the owners, are welcoming and truly embody the spirit of hospitality that, sadly, is missing in many restaurants today. They have a remarkable selection of wines by the glass, and a very inventive menu as well. The decor is much nicer than you would expect of most places on the island, but it is still distinctly casual. An excellent combination of the best of both worlds! Service during my visits ranged from good to great. Even the newest bartender really strived to make me feel at home. The more seasoned servers were even better, with some who recognized me coming up and saying "welcome back" or "good to see you again." Touches like that really make a guest feel special. 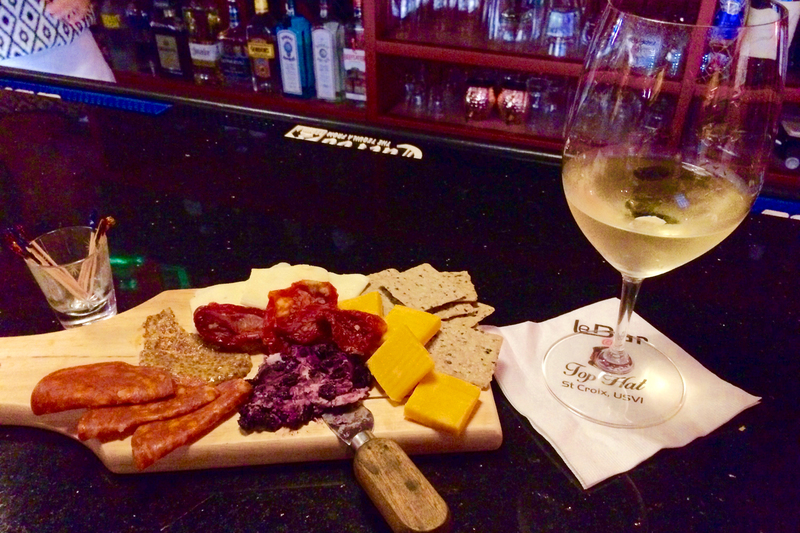 Pair that with balter's excellent food, and you have a winning combination. Those who are staying on the east end of the island or are up for a drive should visit the Cultured Pelican. Ostensibly an Italian restaurant, it offers an excellent variety of non-Italian dishes as well. Over the course of several visits, I enjoyed their mussels, a Margherita pizza, a charcuterie plate, and my favorite: a prime rib dinner on Christmas eve. 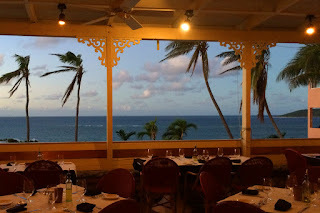 Everything I had was well prepared, service was very good with servers recognizing me from one visit to the next, and the view of Buck Island and the Caribbean are incredible. The only caveat was that they keep their red wines chilled, which means they should be allowed to sit and warm up a bit before being consumed. Still, that’s better that serving red wines too warm, which would be easy to do in the area’s tropical climate. I recommend Maria's for what it is: a slightly divey, but very good Mexican kitchen. You may have to wait for a table, or have a seat at the bar next to some semi sketchy people, but the food makes it all worthwhile. 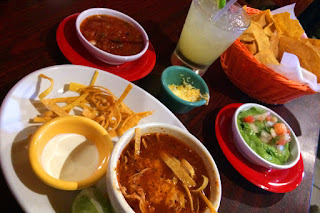 During one visit, I enjoyed a light lunch of chips and guacamole, and a cup of their chicken tortilla soup. I can honestly say I don't remember that I have ever had better tortilla soup! And I've spent a number of years in Arizona and California, where they really know Mexican food. On the down side, the guac was too smooth and rather tasteless, like the premade kind you get in a plastic container at the grocery. Maria's usually has specials in addition to their menu, and they have $2 Taco Tuesdays. If you like good Mexican food, you owe it to yourself to check out Maria's. Toast is a delightful spot for breakfasts that are worlds better than the too-standard food found in many locations. I'm a breakfast snob (and pretty decent cook) so I can't understand why so few places do that meal well. Toast is one that does! 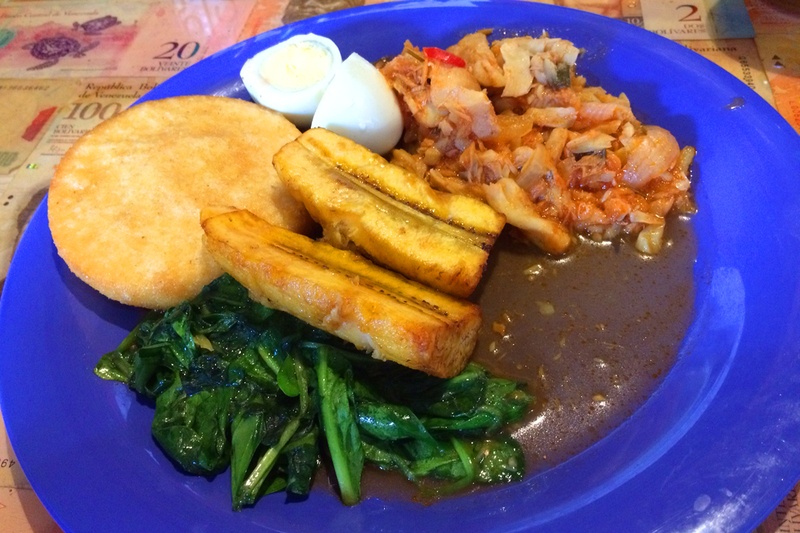 From the modest hashbrown casseroles to the stuffed arepas to an exotic Crucian breakfast of stewed saltfish, fried plantains, boiled egg, wilted spinach and an arepa, the food is always good, as is the coffee. If you’re not working or going scuba diving afterwards, Toast has a great selection of Bloody Marys to accompany your solid food. It's a little small but it's worth enduring a modest wait. Highly recommended! After about a month on St. Croix, the food at my hotel had become pretty predictable, so I was happy to discover the Deep End. I very much enjoyed their weekend breakfasts. As I was off duty, I could enjoy a Bloody Mary or Mimosa. The eggs Benedict were pretty well spot-on, though I like more lemon in my Hollandaise. The server was very accommodating and brought some wedges so I could doctor it to my taste. The view is lovely as well. Prices are the same as everywhere on the island, which is to say higher than the mainland, but no higher than other establishments. Worth the drive, even if you're not tired of the food elsewhere. Popped in for lunch one day and found this little place a notch or two above what I expected, especially for a joint in a heavily touristed area. The bartender came to St. Croix after decades in the hospital industry, but is still taking care of people, as good bartenders do. She was very pleasant, helpful and efficient. The Cuban sandwich was also very good and big enough to take half home (well, to the hotel) for later. Prices were reasonable, so if you're in the area of the old town, waterfront and/or the boardwalk, stop in! I visited Un Amore a few times during my time on the island and, overall, I give this my nod of approval. On my first visit, I had the mussels on the recommendation of an acquaintance who said they were to die for. The mussels WERE very good, with lots of garlic and some wedges of toasty bread, but the broth lacked any punch. The Chianti Classico by the glass was pretty standard, though island-expensive. They do have a pretty fair selection of wines by the glass, as well as by the bottle. I rarely indulge in dessert but the tiramisu had me, so I tried it. Tasty, but with too much cocoa on top. Generous portion, though, so props there. On my first visit, however, service was mediocre. I sat at the bar and the female bartender basically took my order and dropped off my food without any interaction in between, though she found plenty of time to talk with her colleagues and check her cell phone. The pizzas others were ordering looked and smelled incredible, so a colleague and I ordered the house special pizza on a return visit, and it was as advertised. The tomato sauce base was made with smoked tomatoes, which gave it a special layer of flavor. Service was much better than my initial experience, too. Our server was attentive, and helpful about explaining the various dishes and suggesting the wine to accompany our pizza. A nice Italian red available by the glass, at a relatively reasonable price for the island. Some outside seating is available, and there's plenty of parking in a lot shared with other businesses which generally close around 5 o'clock. The name pretty much says it all. It looks like a bar and grill set up in someone's backyard. Like many places on the island, it's open air, so be prepared for that. The food is freshly prepared, on the barbecue off to the side. Or, there are pot pies available from a lady who makes them in a trailer on the property. Over the course of several visits, I enjoyed the pulled pork sandwich, their half pound Big Boy hamburger, their hot Italian sausage sandwich, and a special smoked turkey sandwich. Everything was always fresh and tasty! They have some soft drinks, though the selection depends on what is shipped in, which is one of the quirks of living and working on St. Croix. They also have a variety of bottled beers available. As the island recovers from two major hurricanes, there are more places opening up that serve burgers and BBQ. However, in the three months I was there, I didn’t find any better than this little spot. Parking can be a bit of a challenge but it's definitely worth the hassle. If you're in the area however, and hungry for some meat, this is the place! Recently reopened after a management shuffle, Top Hat exudes the feel of an old school but decidedly upscale bar. Not much on offer in the way of solid food, but a good craft cocktail menu and some pretty nice wines by the glass. Add to that the classic jazz playing in the background and some not unattractive (female) bartenders, and what more could one ask? Well worth a stop for cocktails or that before- or after-dinner drink! The sole sushi restaurant on St. Croix, Dashi offers up what I describe as only a fair approximation of authentic Japanese sushi. 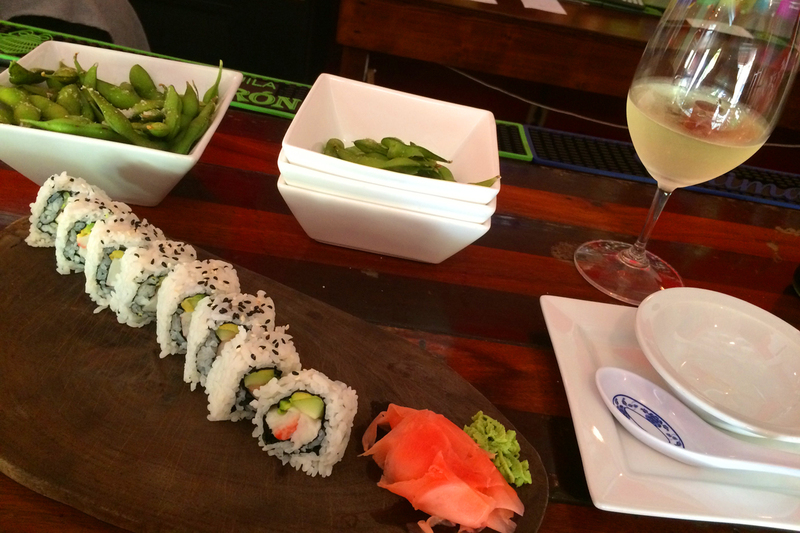 For lunch one afternoon, I ordered edamame, miso soup and a California roll. The miso soup had vinegar in it; a proper miso soup does not. The rice for the California roll did not have enough vinegar in it, and so did not hold together or have the flavor that properly prepared sushi rice should have. In addition, the roll was not rolled tightly enough, and had a tendency to fall apart. Beyond that, the ingredients lacked flavor. Had it not been for the wasabi, it would have been almost flavorless. The edamame were good, so all was not lost. If you have enough to drink beforehand, it probably won't matter. However, if you want authentic Japanese sushi, this isn’t it. After a first experience that was less than wonderful, a couple of colleagues coaxed me to try Zion a second time. It was definitely a step up from my first experience and I was glad they encouraged a return trip. On both visits, the food was quite good. 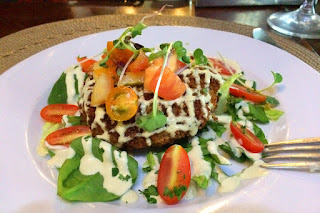 The first time, I had a crabcake that was the best I've had outside of Maryland, but I was sitting at the bar, and the bartender essentially ignored me. The second time, three of us sat in the courtyard and got service that was pretty good considering the late hour we arrived. Having worked in the industry, I know that servers get eager to go home as it gets later. Quite understandable, as serving is physically very hard work. Regardless of the hour, our server was there for us whenever we needed him, told us about the daily specials, checked back just often enough, and generally made us feel welcome. Because it was late, I didn't want to eat a big meal, so I just had the beef carpaccio appetizer. It could easily have been shared among several people, but also made a very nice light dinner for one. It was quite delicious. Our server suggested some wines to accompany our dishes, and his suggestions were spot on. My companions enjoyed their entrees as well, with one taking home about half of her generous serving of house-made pasta. With the second experience under my belt, I would say Zion is worth a try, but definitely sit in the courtyard unless you want to be ignored. Once well-regarded by the locals, Angry Nate’s still seems to be suffering from the effects of the two hurricanes. On my very first visit, one of the owners told me most of his service staff had evacuated before Hurricane Irma, so he’s had to hire whomever he could find. To my observation, they’re not experienced restaurant people. When three colleagues and I went there for dinner, both the bar and the kitchen seemed off. There were only four of us, but either the bartender couldn't manage to make four drinks, or the server didn't know to wait until she had all four before serving them. When it came time to eat, our entrées came out one at a time, just like our drinks had. A kitchen that is on its game will see that the entire table's food comes out at the same time. Obviously, Angry Nate's kitchen is not there. The food itself was only so-so. I didn't finish either my appetizer or my entrée, nor did I take any of it with me. It simply wasn't good enough. Went back one morning for a Mimosa. A Mimosa is simply OJ and champagne, poured into a glass. No fuss, no bother. I don't know whether they consider it their "house" preparation at Nate's, but it was not good. The bartender poured champagne and OJ into a shaker, maybe added a dash of bitters, then stirred it before pouring it into a glass. The result was a watery orange juiced-based drink with ZERO sparkle left in it. Definitely NOT a proper Mimosa. As I said, they may still be recovering from the hurricanes but Nate's still has a long way to go. 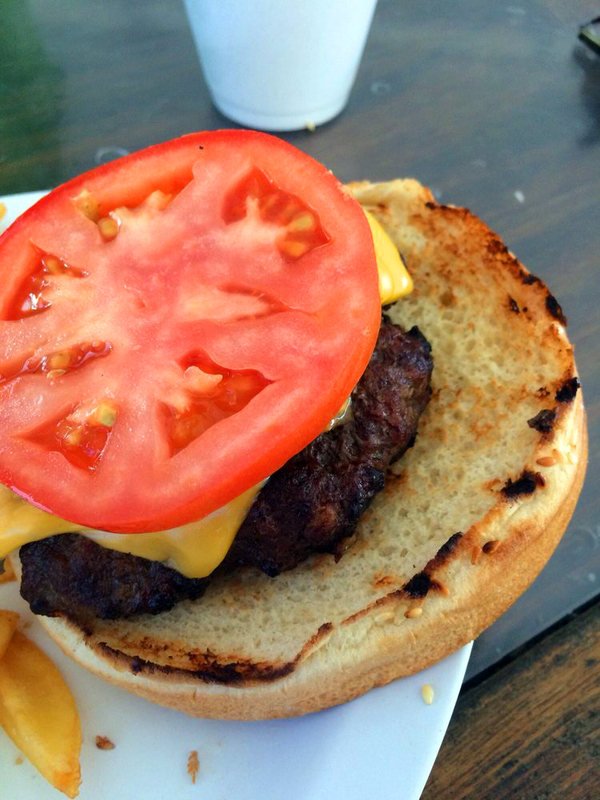 Yes, they tried Cheeseburger in Paradise, but Jimmy Buffett wasn’t going along with that. Went to this largely outdoor restaurant for lunch once and, though the weather was lovely, it wasn't very crowded so perhaps that should've been a clue. Overall, I thought it was only OK; certainly not as wonderful as its reputation. Service was good. My server was right over with a menu and took my drink order, then came back for my lunch order. I ordered a burger, medium, topped with sautéed mushrooms and French fries on the side. The burger came out more medium well, and there was a lot more bun than burger. Fries weren't impressive. Typical precut, out-of-a-bag variety. I thought the prices were a bit high, even for the island. $11 for the burger when Blues Backyard sells essentially the same burger for $7.50? I know they're not exactly around the corner from each other, but it's not THAT big an island. Ate lunch at the chicken shack a couple of times during my tour of duty. Both times, I had the half chicken with johnnycakes, one of the best lunch bargains on the island at only $7. The johnnycakes were good, the chicken was fresh and juicy with crispy skin, but it lacked a bit of flavor, either from smoke or barbecue sauce. Maybe that's just their style, but I expected more of the place. They certainly do a brisk business, so they must be doing something right. As for me, I thought it was only OK. I wouldn’t go out of your way to get there; it just wasn't that great. Despite the name, it’s not a bait stand at all; it’s a sports bar. I went there three times and it was always the same: you order and get your first beverage, and then you're basically ignored. On my final visit, I ordered the chips and cheese dip on the happy hour menu. It seemed to take forever for what is a simple dish. When it came though, it was pretty tasty for what it was. Much better than the sliders I'd had on a previous visit, which were just plain overcooked patties served on stale buns. When it came time to leave, I had to hunt down my server, who was deep in conversation with (wait for it) other servers. Unremarkable (and sometimes BAD) food and lousy service are not a good combination. Finally, the place allows kids and families with crying babies. That may be typical for the island, but when I go to a supposedly adult establishment, I don't want to hear snarky teens and whining toddlers. Stopped there once and got an order of mac & cheese, and grilled chicken. In about an hour, I was in the washroom having a most unpleasant experience. On top of all that, it seemed pretty pricey. $11 for two sides. And unless you're local, don't expect anything other than basic service: get you your food and take your money. No reason to go back as far as I can tell. Too many places that treat visitors like they're happy to see them, not like they're interrupting the staff's conversation with their friends. A sad little place trying to be hip, but tragically falling far short. Inflatable figurines of sea creatures hanging from the ceiling contribute to the "close but no cigar" feeling. Service was quick, if not particularly friendly. Food was fresh and tasty enough, but nothing special. Don't want to be disrespectful of our senior citizens, but there were lots of gray hairs at the bar, talking too loudly about things nobody else wants to hear about. Nice view of the Caribbean, especially if you can sit on the lanai, but don’t expect too much in the way of either food or service.